The Battle of Muar was the last major battle of the Malayan campaign. 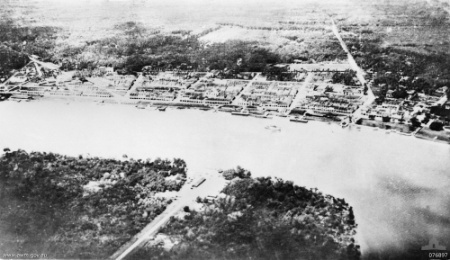 It took place from 14–22 January 1942 around Gemensah Bridge and on the Muar River. After the British defeat at Slim River, General Archibald Wavell, commander of ABDA, decided that Lieutenant General Lewis Heath's III Indian Corps should withdraw 150 miles south into the State of Johore to rest and regroup, whilst the 8th Australian Division would attempt to stop the Japanese advance. Allied soldiers, under the command of Major General Gordon Bennett, inflicted severe losses on Japanese forces at the Gemensah Bridge ambush and in a second battle a few miles north of the town of Gemas. 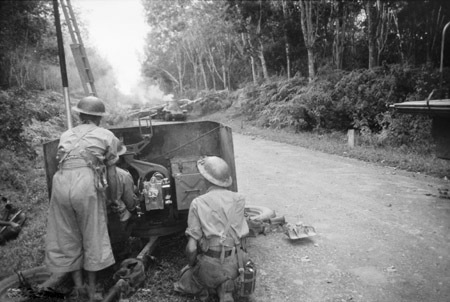 Members of the Australian 8th Division killed an estimated 700 personnel from the Japanese Imperial Guards Division, in the ambush at the bridge itself, whilst Australian anti-tank guns destroyed several Japanese tanks in the battle north of Gemas. Although the ambush was successful for the Allies, the defense of Maur and Bakri on the west coast was a complete failure which resulted in the near-annihilation of the 45th Indian Infantry Brigade and heavy casualties for its two attached Australian infantry battalions. This is the first engagement between units of the British 18th Division and Japanese forces in Malaya. In January 1942 an Australian and Indian force engaged in a desperate battle against the Japanese Imperial Guards Division that ended [here] at Parit Sulong. Weakened by defeat at the Muar River, the 45th Indian Brigade and a support battery of the 2/15th Field Regiment retreated and an Australian force was sent to restore their lost position. The 2/29th Battalion with a troop of the 4th Anti-Tank Regiment was deployed first. The 2/19th Battalion followed, with men of 8th Division Signals maintaining communications.